OWC this week is announcing the newest member of its family of "extreme performance drives," the ThunderBlade V4. The ThunderBlade V4 is an external drive targeted at professional users who need the fastest possible speeds, and it packs four M.2 solid state drive blades into a single enclosure that runs over Thunderbolt 3, with total capacities ranging from 1 TB to 8 TB. The result is what OWC says is the "fastest SSD ever made," with read speeds topping out at 2800 MB/s and write speeds up to 2450 MB/s. We've spent a bit of time with the ThunderBlade V4, and it's definitely an impressive piece of technology, although its pricing that starts at $1200 and rises significantly from there will limit the potential market. This is an accessory for demanding professionals who need to squeeze every bit of performance out of their external drives and is undoubtedly overkill for consumers simply looking to back up their computers. The ThunderBlade V4 comes in a hefty aluminum enclosure covered in large fins to help with heat dissipation, as this drive can get fairly warm when you're reading and writing a lot of data. There is no active cooling in the drive, which helps with the ThunderBlade V4's ruggedness as there are no moving parts. The only feature on the front of the ThunderBlade V4 is a thin three-inch long LED that shines white when connected to power (and also when connected to a sleeping computer) and blue when the drive has an active connection to a computer. While the LED appears to be a single thin indicator, it's actually made up of four distinct segments, one for each M.2 drive in the ThunderBlade. Each segment will blink blue when data is being written to or read from the corresponding drive. With the speed of the drive and the four onboard SSDs, you'll see a sort of flickering ripple effect across the LED as data is moved. The Thunderbolt 3 ports are capable of supplying 15 watts of power each, but that won't be enough to power a MacBook Pro. This isn't intended as a true docking station, however, so it's not surprising that the power output is limited and primarily intended to drive downstream peripherals rather than host computers. 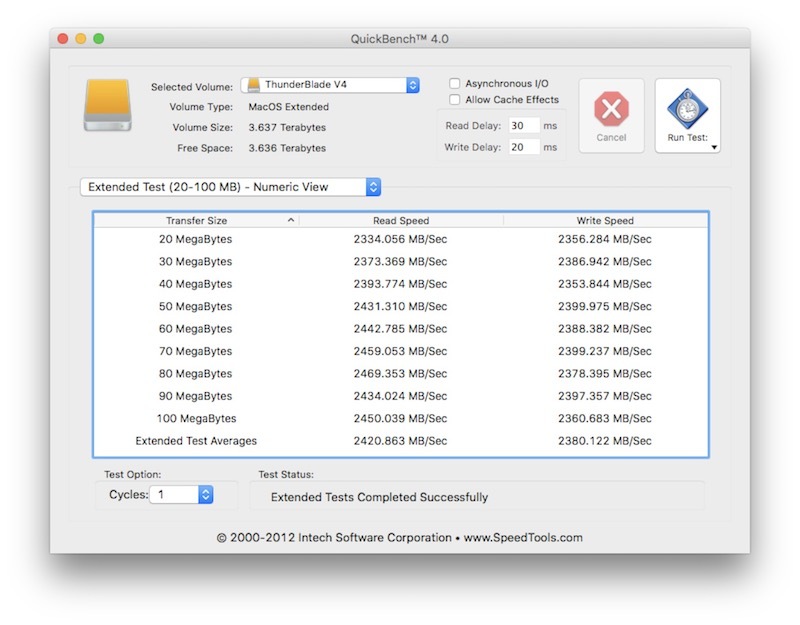 We ran some QuickBench disk speed tests on the ThunderBlade V4, and while we didn't quite hit OWC's top numbers, the drive still showed some seriously fast performance. 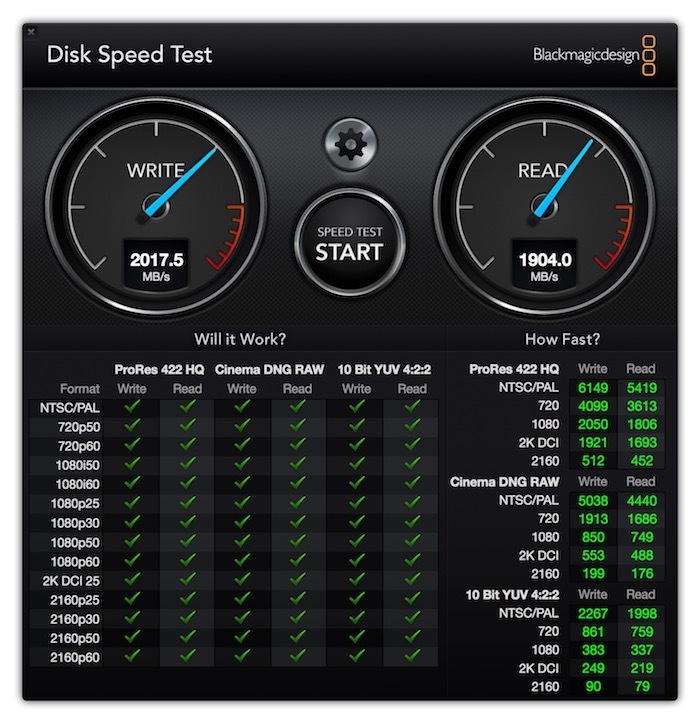 Connecting directly to a 2016 15-inch MacBook Pro, we saw read and write performance in the range of 2400 MB/s in extended testing mode with transfer sizes in the 20–100 MB range. Similar speed tests using Blackmagic with larger transfer sizes of 5 GB yielded slightly lower speeds of over 1900 MB/s read and 2100 MB/s write, although it is difficult to directly compare the two different methodologies. Even that performance allowed the ThunderBlade to ace Blackmagic's "Will it Work?" rating system that determines whether a drive is fast enough to handle video in various combinations of formats, resolutions, and frame rates. Results were similar in various configurations even when other peripherals up to and including a pair of LG UltraFine 5K displays were connected to the MacBook Pro's other Thunderbolt 3 ports. The four SSDs inside the ThunderBlade V4 come preconfigured in RAID 0 format to offer the full stated capacity of the drive. A license for OWC's SoftRAID XT (formerly SoftRAID Lite) is included with the ThunderBlade, and the software can be used to reformat in RAID 1 to provide mirrored redundancy. 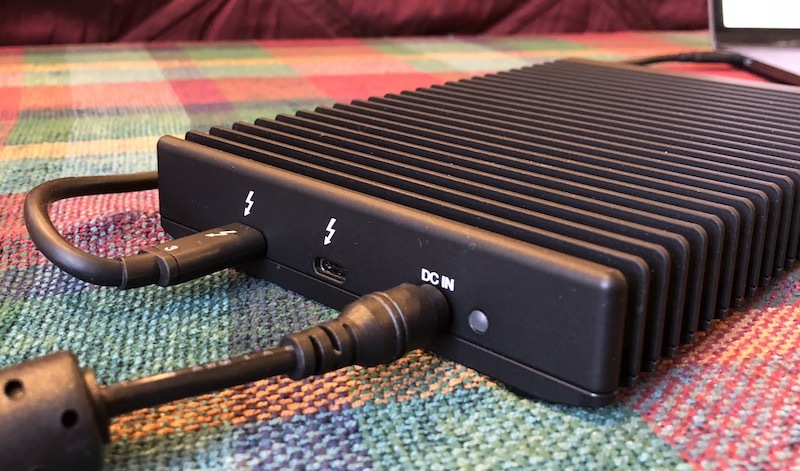 With the downstream Thunderbolt 3 port on the ThunderBlade V4, you can daisy chain multiple units together for even more storage, although you're of course limited by the total bandwidth of the single Thunderbolt 3 connection they're all running over. You can even set up two ThunderBlade V4 units as a single RAID array. 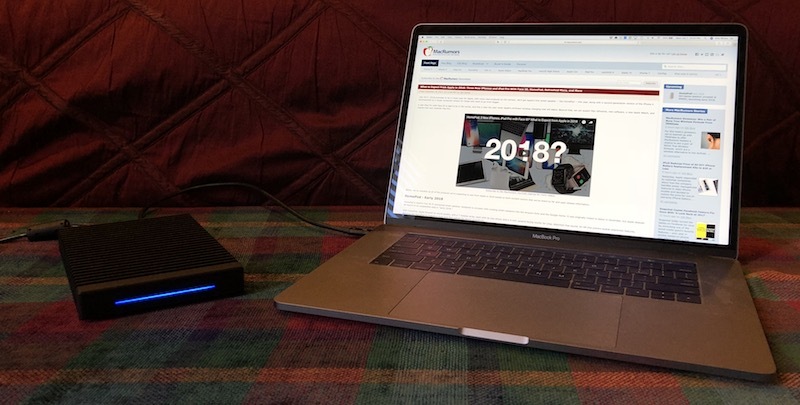 As should be expected for a product with large storage capacities using the fastest SSD designs and Thunderbolt 3, the ThunderBlade V4 isn't cheap. The 1 TB model is priced at $1199.99, with the 2 TB model at $1799.99, the 4 TB model at $2799.99, and the 8 TB model at $4999.00. Note: OWC provided the ThunderBlade V4 to MacRumors for the purposes of this review, and it will be returned to OWC. No other compensation was received. MacRumors is an affiliate partner with OWC and may earn commissions on purchases made through links in this article. the 8 TB model at $4999.00. The iMac Pro seems like a bargain now! Nice design. Will buy one for me Word documents. Outstanding! I know most people do not have a need for the speed this little beast provides, but I certainly do. This will be the perfect device for me. I travel extensively and this will be perfect for the productions I work on in which I need to collect and edit multi-cam full-frame (35mm) 4K 60 fps files. And the best part? When I walk back into my studio, I can simply plug it right into the iMac Pro (that I will be getting in two months) and pick up right where I left off when I was on the road. No transferring files...just one super fast portable drive that can be plugged into the machine of choice. No video? Come one, you don't expect us to read all that, right? Please. I just read that in way less time than I'd spend watching some video that shows less information but parcels it out more slowly. ... the finned, aluminium casing suggests that the unit is designed to run hot (or at least warm). I wonder how much that will shorten the life of the SSDs. If the unit was designed to "run hot" it would not have the heat-dispersing fins, right? I mean, it generates heat but is apparently engineered to move that heat away from the interior. Hey one question that just occurred to me, these volumes are configured to use HFS+, why not APFS? They are M.2 SSDs after all, and if I reformat them would that ruin the RAID 0 configuration in this drive, or just improve performance? Edit: I guess that's two questions. This is an accessory for demanding professionals who need to squeeze every bit of performance out of their external drives and is undoubtedly overkill for consumers simply looking to back up their computers. I’m sure my dad will pick up one to backup his Word docs. This sounds perfect for the next MacRumors giveaway :). Ordered one. Larry and the OWC team always killing it.